Gregg Hertzlieb: "Ed Paschke: 'Strano'"
that the painting is a summary on a small scale of the artistâs central themes and concerns. an almost sacred quality. The fact that the subject is so fanciful and idiosyncratic produces a curious and challenging visual puzzle; what initially arose from such low-brow or eccentric sources is every bit as substantial technically and metaphorically as any classically representational work, or any work arising from purely fine art considerations. The Imagists were able to manipulate and polish their intensely introspective thoughts and highly personal bodies of imagery into works that are fascinatingly, surprisingly, entertainingly transcendent. affecting portions of the face has been a common component of Paschkeâs work since the late 1970âs and may relate both to Paschkeâs interests in the appearance of televised images and a possible commentary by the artist on manâs identity in the modern age. 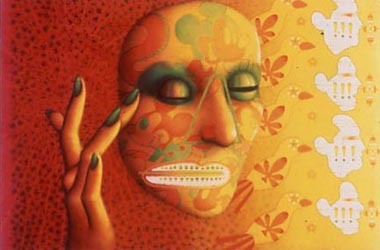 It should be noted here that Paschke is interested only in the illusion of electronic light; he does not use a computer or projector to generate his work. Rather, his paintings and drawings are done entirely free-hand, a fact which is further testimony to his skills as a draftsman. The Mickey Mouses that seem to dance across the face are a visual reference to the tattooed figures so central to Paschkeâs early work. In addition, they provide another level of pictorial reference, contrasting in their boldness and abstraction with the very different kind of abstraction seen in the portrait face. Mickey Mouse, in Stranoâs context, may not be primarily important as an individual character, but more as an easily recognized indicator or representative of a cartoonâs visual shorthand. Perhaps also, in the cyberspace of the painting, the floating Mickey Mouse figures can be thought of as pieces of electronic detritus, drifting through and attaching themselves to a solid form that holds them in place. exclamation points within these profiles seem to reinforce a public, instructional interpretation, since they communicate by their nature a general feeling but have no specific application. The picture of the Native American headdressed figure, almost unseen in the left-hand purplish-red portion of the painting, seems to relate stylistically to ancient petroglyphs or drawings by Native Americans in pictographs on paper or hide. Whatever the original source or inspiration for this obscured image, it provides an additional representational style to contrast with the numerous other picture-making approaches seen in Strano. In Paschkeâs surreal work from the Brauerâs collection, an image most likely from a popular culture source is transformed by Paschkeâs selective transformative eye and hand. To add complexity and richness to the environment of this central bizarre personage, the artist adds forms that relate and refer to other visual products in the world that have personal significance for the artist. The resulting portrait, lit by a glowing technicolor that exists only in the virtual, televised, and imaginative realms may be composite in nature, built from a variety of source materials. It appears to the viewer, however, as satisfyingly complete and silently urging him to unlock the mysteries in its pictorial depths.